The Masonic Villages proudly provided charitable care and community services worth approximately $48.9 million across the state in 2017. As a not-for-profit organization, and as part of our Mission of Love, Masonic Villages extends services to surrounding communities, filling the needs of individuals of all ages. Efforts focused on enhancing local businesses and nonprofits, supporting economic development, enriching students, engaging children, assisting those in need and encouraging residents’ participation. 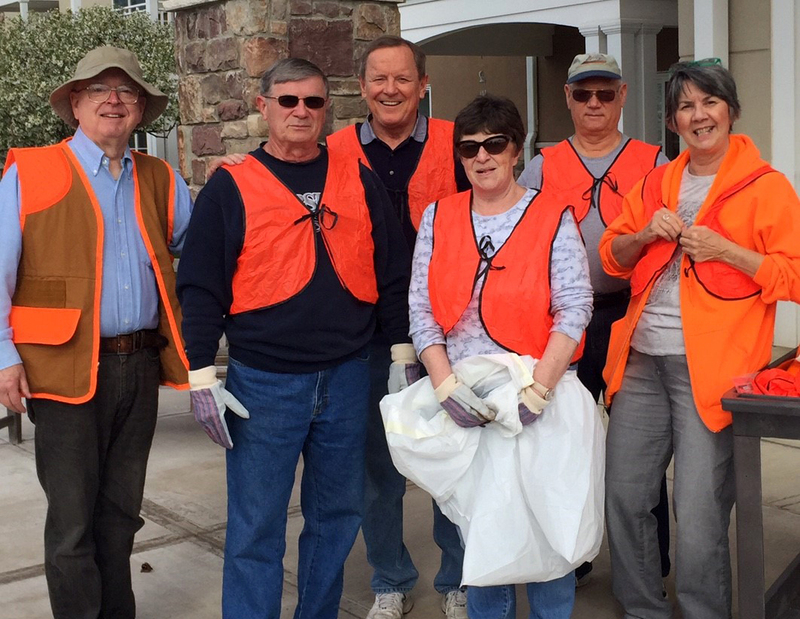 Masonic Villages works with other organizations to help fulfill needs in the community, some of which also benefit our residents. We partner with local schools for mutually beneficial intergenerational programming among senior residents and youth at all our locations. Masonic Village at Dallas coordinated programs which were open to the public including educational seminars, a self-defense clinic and Tai Chi for Arthritis® classes in 2017. AARP held Driver Safety Courses in Sewickley and Lafayette Hill, which were open to the local community. Masonic Village at Lafayette hosted a blood drive and free health fair for the public. The Greater Elizabethtown Area Recreation & Community Services (GEARS) hosts fitness classes at our Elizabethtown campus, and 2,463 people from the local community participated in 2017. Masonic Village donated approximately $50,000 worth of space for these programs. There is no charge to GEARS, thanks to a mutually beneficial agreement. Masonic Village at Lafayette Hill’s food services department hosted interns from Job Corps and is instrumental in providing feedback on Job Corps’ program so students and instructors are aware of industry standards that have changed to ensure they’re producing a qualified workforce. In a new partnership with Elizabethtown College that benefits students and Masonic Village residents, biology students have the opportunity to earn 40-hour CNA certification, which includes classwork, direct interaction with residents and a competency test. The program was highlighted on ABC27. “The partnership is a perfect blend of two institutions’ missions: education for service combined with the personalized health care of Masonic Village. As Elizabethtown College educates the future health care professionals in the classroom and laboratory, this partnership allows the students to obtain the clinical experience of caring for the health and welfare of individuals. The most beneficial outcome is the interpersonal relationship skills and bonds that are developed. 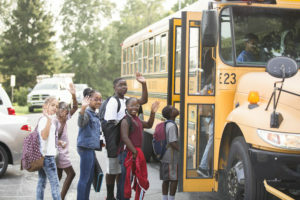 Not all students have extended family to interact with and learn from. These CNAs learn about humility, compassion and service at a level that can never be replicated in a classroom. As a not-for-profit organization, Masonic Villages is not required to pay real estate taxes; however, we value municipalities’ services and understand their plights, as costs impact local taxes. Through Payment in Lieu of Taxes (PILOT) agreements signed in Dallas, Elizabethtown, Lafayette Hill and Sewickley, we paid $2,131,569 to local boroughs, townships, counties and school districts in 2017. Supporting the local economy is also a priority. Through contracts with 418 businesses in the Dallas, Elizabethtown, Lafayette Hill and Sewickley areas, Masonic Villages generated expenditures of $6,481,560. Implementing eco-friendly operations and initiatives is an important investment in our community’s and planet’s future, whether it’s restoring a portion of the Conoy Creek, expanding our solar power plant or protecting soil and water resources while operating a beef cattle and farm enterprise. For the past 11 years, Masonic Villages has been implementing a comprehensive sustainability plan, including renewable energy projects, energy auditing and more than 80 individual efficiency projects. Sustainability projects and initiatives in the areas of water efficiency, sustainable sites (biomimicry), materials (recycling) and indoor environmental quality have also been completed. Residents of the Bleiler Caring Cottage collected 50 blankets to donate to Water Street Mission in Lancaster. The Masonic Village Farm Market donated more than 50 pounds of food weekly to the Elizabethtown and East Donegal-Conoy Food Banks and more than $1,000 in gift certificates to local civic, scout and religious groups for fundraisers. The market also donated 400 bushels to local food banks and Lancaster County Meals on Wheels. Collectively, Masonic Villages’ five locations contributed $171,820 to the Raising a Reader program, which provides books, materials, parent training, engagement support and library connections to empower children to read, learn and succeed. 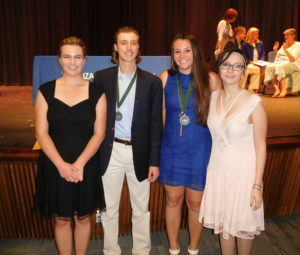 At Masonic Villages’ Elizabethtown and Sewickley locations, we awarded $32,500 in scholarships to graduating seniors who volunteered at least 100 hours with us during their high school years. While in high school, Isabella Malcolm volunteered with the recreation department at the Masonic Village at Sewickley delivering mail, escorting residents to and from events, coordinating activities and helping with other miscellaneous tasks. She is currently a sophomore at Franklin & Marshall College, where she is pursuing a degree in public health with a minor in French. In lieu of printing Masonic Villages’ Community Report this year, we decided to “go green” and produce only a digital report, and donate the money budgeted for this project to charitable organizations serving local seniors. Donations totaling $15,300 were made to Weinberg Regional Food Bank in Luzerne County, Northwest EMS and the Community Cupboard in Lancaster County, The Christmas Gala in Bucks County, Colonial Neighborhood Council in Montgomery County and Allegheny County’s OPTIONS program. Education is the basis for success, and Masonic Villages is proud to help young students build a strong foundation for a bright future. Working with local schools and universities, we welcome students seeking internships and job shadow experiences. 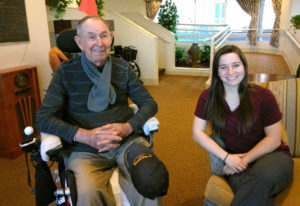 Masonic Village at Dallas has long enjoyed a mutually beneficial relationship with Misericordia University, and for the third year, collaborated with the school’s Physical Therapy Department for a balance and fall prevention program in 2017. Residents worked one-on-one with graduate students each week, completing an initial assessment, exercising weekly and then completing a final assessment at end of the program. Students gain real world experience, and residents have seen the health benefits in balance and strength. In 2017, across the state, interns joined us in the volunteer services, human resources, food services and public relations departments, executive director’s office and at the Masonic Village Farm. In clinical settings, including the Adult Daily Living Center and wellness center and in the nutrition services, nursing (interns and clinical students), pharmacy, physical and occupational therapy, music therapy, social services, environmental services, health care administration and therapeutic recreation departments, staff supervised 185 students for more than 10,170 hours – time worth approximately $71,960*. 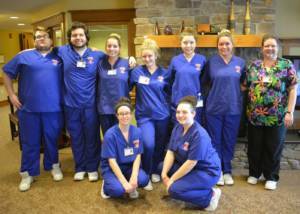 Included in the values above, students from Lincoln Tech, Drexel University, Penn State University, Harrisburg Area Community College, Lancaster County Career & Technology Center and Beaver County Career and Technology Center (BCCTC) completed public health clinicals with Masonic Villages. 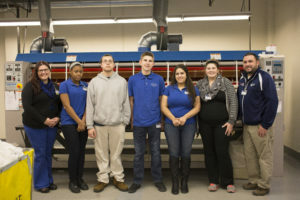 Four Plymouth Whitemarsh High School’s Life Skills students worked with Masonic Village at Lafayette Hill’s food services and environmental services departments at the start of the fall school semester. For several years, Masonic Village at Elizabethtown has teamed up with Lancaster-Lebanon Intermediate Unit 13 to offer students internships and real world job experiences. In 2017, staff spent 1,292 hours training more than 50 students, time worth approximately $4,605*. *Based on national community benefits reporting standards, 20 percent of staff time overseeing students in a clinical setting may be quantified as a community benefit. Community members at any stage of life can find assistance at Masonic Villages. Last year, in Elizabethtown, an average of 12 individuals, including community members and Masonic Village residents, participated in the monthly Dementia Family Support Group. An average of seven individuals per month attended meetings of the Bereavement Support Group. Masonic Village contributed approximately $3,373, including 92 hours of staff time, materials and classroom space, toward these support groups. Masonic Villages’ Outreach Program runs a Medical Loan Closet which provides equipment to families on a short-term basis free of charge. We supplied wheelchairs, walkers, canes, shower chairs and other equipment to 26 individuals in 2017. Funded through generous contributions, the Masonic Children’s Home in Elizabethtown does not charge individuals, organizations, or the state or federal government for its services. It provides a home for up to 40 youth who are being raised by aging grandparents or who come from various social or economic environments which do not provide necessary security and support. Children do not need to have a Masonic affiliation in their family to be eligible for services. 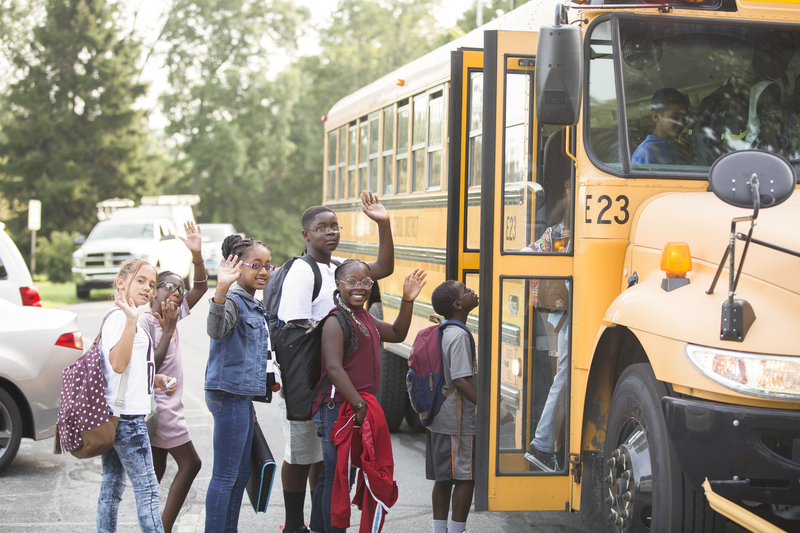 In 2017, the Elizabethtown Area School District received $334,769 through reciprocity agreements with the school districts from which the children come to us. At the Masonic Village Child Care Center in Elizabethtown, managed by Bright Horizons Learning Centers in 2017, tuition rates do not cover the cost of operations. Masonic Villages subsidizes the costs in order to provide the community with a high quality child care option. We provided quality child care services for 153 children, ages 6 weeks to 11 years, in 2017. Approximately 68 percent of the children come from the community and 32 percent are related to Masonic Villages staff. In 2017, $70,300 in kindergarten and pre-kindergarten scholarships were awarded to income-qualified families, thanks to Masonic Villages’ participation in the Educational Improvement Tax Credit Program and donations from local businesses. The scholarships supported families attending the Masonic Village Child Care Centers in Elizabethtown and Sewickley and other local child care providers. Many Masonic Villages residents are active in the community. Last year, residents contributed to service projects that benefitted children, older adults, the homeless, those with food insecurities and international humanitarian efforts. Through the Congregation of Sell Chapel’s Community Outreach ministry in Elizabethtown, members donated $27,000 in offerings toward Elizabethtown Community Housing and Outreach Services (ECHOS), The Children’s Playroom of Lancaster, Clare House, Hope Within and Communities That Care. One of its newest recipients is a program for the homeless at St. Paul’s United Methodist Church. The congregation also contributed $21,000 to flood relief in Puerto Rico, Texas and Florida and $33,000 toward the Masonic Village Employee Assistance Fund. Residents participated in and raised money for the CROP Walk, which benefits the Elizabethtown Food Bank, and volunteered with ECHOS, the Children’s Playroom and the Elizabethtown Area School District’s Buddy Program. The Woodworking Club at the Masonic Village at Sewickley crafted wooden toys for the Shriners Hospitals for Children. Masonic Village at Dallas residents participated in an Adopt a Road project to help clean up nearby Country Club Road, and for the seventh year, supported the Trinity Presbyterian Church’s Backpack Project to benefit the Child Development Center. Residents of the Masonic Village at Warminster cut, sorted and packaged bags with coupons, which were delivered to service personnel for use on their base commissaries. Residents in Elizabethtown, Lafayette Hill and Sewickley knit blankets, robes and hats for Project Linus, a national nonprofit organization which donates blankets to children in hospitals, including the Shriners Hospitals for Children; shelters; social service agencies; or anywhere a need arises. They knitted and donated more than 250 blankets in 2017. Fulfilling our commitment to serve others regardless of their financial means, in 2017, Masonic Villages provided $48.9 million in charitable care and services across the state, thanks to those who believe in and have donated toward our mission. Masonic Villages also supports the community where and when a need arises. As detailed above, between awarding scholarships to teen volunteers, donating to local emergency service providers, hosting interns and inviting community groups to use our facilities free of charge, we gave back more than $778,800 in support and services to the Dallas, Elizabethtown, Lafayette Hill, Sewickley and Warminster communities in 2017.